Exploring art museums with the family can open children’s minds to new experiences and new ways of learning. The CMA has created a family friendly space that does just that. 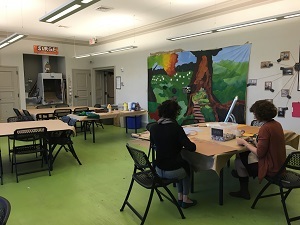 The Center for Creativity is a space on the first floor of the museum where visitors create their own art. Every Saturday from 1:00 until 3:00 p.m. in Open Studio, museum staff provides materials and motivation to inspire creativity. “We have lots of unique, funky stuff,” Molly Uline-Olmstead, Manager of the Studio Initiative, explained. “We work with materials that provoke more questions than answers.” Open Studio is free with admission to the museum. Other programming, as well as information about special exhibits, can be found at www.cmaohio.org. “We’re standing in Columbus at a unique point in time,” commented Principal Architect Michael Bongiorno of DesignGroup, on the recent renovation of the building. “Columbus is experiencing a renaissance, and I believe visitors will be looking at the museum in a new way.” A restaurant with fresh, high quality food, a bright, open museum shop, a beautiful outdoor sculpture garden, plenty of elevators and stairways, and restrooms on every floor make the newly renovated building comfortable and easy for families to navigate. 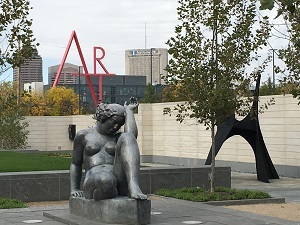 The Columbus Museum of Art, at 480 East Broad Street, Columbus, Ohio, is located in the center of the state at the intersection of I-70 and I-71. The downtown location of the museum makes it accessible to the highway and downtown hotels. Parking at the museum is free for members and just $1 per hour for non-members. The museum is open Tuesday through Sunday from 10:00 a.m. to 5:00 p.m. and until 9:00 p.m. every Thursday. Daily admission is $14 per adult, $8 for seniors and students six and older, and free for members and children five and younger. Admission is free on Sundays. The museum participates in the North American Reciprocal Museum Association, so if you belong to your local museum, admission may be free.